Donald Trump's comment on Tuesday about how "Second Amendment people" could stop Hillary Clinton if she gets elected is hardly subtle. This is a clear provocation to commit murder, however he and his handlers may try to spin it. 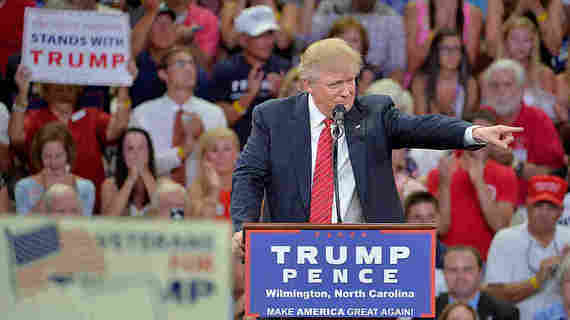 At a rally in Wilmington, N.C. , Trump told the crowd that "Hillary wants to abolish -- essentially abolish the Second Amendment." Of course, this isn't true. This is how Trump and his NRA friends refer to people who want tougher gun control laws. But that wasn't the most inflammatory thing he said. "And if she gets to pick her judges," Trump went on. "Nothing you can do, folks." "Although the Second Amendment people, maybe there is," he added. He was suggesting that "Second Amendment people" -- clearly, gun owners -- deal with Hillary before she gets to appoint Supreme Court justices who will permit strong gun laws. And he didn't mean invite her to an NRA meeting. A week ago, reporters were writing about whether Trump's invitation to Russian President Vladimir Putin to hack Hillary Clinton's emails was treasonous or otherwise illegal. That was bad enough. But now this. As Ezra Klein pointed out in a Vox column and video last week, there are no words to describe this kind of behavior. "Abnormal" doesn't do it justice. Nor does "monstrous." "Sociopathic" might describe Trump's condition, but it doesn't describe our condition as we routinely hear such Trump statements on the campaign trail. The only thing that comes close is philosopher Hannah Arendt's notion of the "banality of evil." She coined this phrase in her 1963 book, Eichmann in Jerusalem: A Report on the Banality of Evil, about the trial of Adolph Eichmann, a top administrator in the machinery of the Nazi death camps, in an Israeli courtroom. If someone carries out unspeakable crimes often enough, he or she comes to accept them as "normal." That was Arendt's view of Eichmann. But the "banality of evil" also applies to an entire society. We can get used to outrageous things -- slavery, Jim Crow segregation laws, massive homelessness, widespread malnutrition, the frequent killing of Black men by police -- until we are provoked to view them as unjust. "Many of his comments are just stupid. But others are dangerous, and some may be illegal. Who draws the line? And what do we do to a public figure who crosses it?" This is the dilemma now facing Americans -- and particularly American journalists -- in thinking about Trump's presidential campaign. We've become so used to his daily outrages -- about Mexicans, about women, about Muslims, about NATO, about nuclear weapons, about "Mexican" Judge Curiel, about renegotiating America's debt with other countries, about getting Mexico to pay for a wall on the border, about Melania Trump's plagiarizing Michelle Obama's speech, about his Trump University con job, about his ignorance of basic issues like Brexit, and many more -- that we're almost numb to them. It is difficult to renew outrage day after day. Many of his comments are just stupid. But others are dangerous, and some may be illegal. They reflect a temperament and mental instability that makes him unfit to be president. It is a matter of what kind of words, and what kind of behavior, crosses the line so blatantly, and violates whatever standards of basic decency we have, that it is beyond contempt. But who draws the line? And what do we do to a public figure who crosses it? "If you're a working journalist and you believe that Donald J. Trump is a demagogue playing to the nation's worst racist and nationalistic tendencies, that he cozies up to anti-American dictators and that he would be dangerous with control of the United States nuclear codes, how the heck are you supposed to cover him?" Reporters don't want to be glorified tape recorders, just transcribing what Trump (or any other candidate) says without providing context and, if necessary, correction. Reporters faced this dilemma in 1950, when Senator Joseph McCarthy began giving speeches accusing the U.S. State Department of harboring Communists. In almost every speech, he used different numbers of alleged "reds" inside the department. Reporters who covered McCarthy knew he was lying, but they couldn't write that. They couldn't even say he was "inconsistent." If they wanted readers to understand that McCarthy had gone overboard with his accusations, they had to find other politicians to say so. They had to be "balanced." That's what passed for "objectivity" back then. He said versus she said. We've made some progress since then -- allowing journalists to analyze as well as report -- but reporters and editors still find themselves in a journalistic straightjacket when covering Trump on the campaign trail. (I was going to write "someone like Trump," but although there are many whackos in recent politics -- think Sarah Palin -- there isn't anyone else really like Trump, and certainly no one who has won a major party' s nomination for president). The stories about Trump's "Second Amendment" comment reflect this journalistic conundrum. How do you report a story about a candidate for president implying that people with guns might want to consider killing his opponent? Yes, that isn't what he actually said but it is clearly what he meant - or what he wanted his supporters to hear. That was his dog whistle. But you don't need to be a dog to know what he was saying. Even so, reporters and headline writers couldn't report what Trump meant, only what he said. They could call his comment "controversial" or even "inflammatory," but they did say what was obvious to everyone in that room and anyone who watched the video. "Trump in trouble over 'Second Amendment' remark" (Politico). All these headlines are accurate but misleading. They don't explain what he meant or put what he said in political context. The subhead on the Politico story -- "The campaign says he was referencing gun-rights voter mobilization, but the remark was widely interpreted as a joke about using guns against his Democratic rival" -- is about as close as any of them got to explaining the importance - and the outrageousness, and perhaps the criminality - of what Trump said. Headlines or news reports suggesting that Trump's "Second Amendment" comment was a "joke" reflect the "banality of evil" problem. A joke? Really? Peter Dreier is E.P. Clapp Distinguished Professor of Politics at Occidental College. His most recent book is The 100 Greatest Americans of the 20th Century: A Social Justice Hall of Fame (Nation Books).